As an educator himself, a consistent theme of Lisle's work on the Board has been to help provide the financial and other support needed to help assure educational opportunity for Newton schoolchildren. Here are some of the many ways he has helped. Newton schoolchildren deserve appropriate educational facilities. As President of the Board, he helped facilitate the votes on the various bond authorizations needed to fund an enhanced Newton South High School, including new athletic fields and tennis courts, as well as a new Newton North High School. 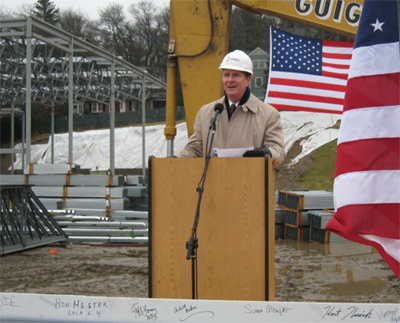 Lisle speaking at the "topping off" ceremony where the last steel beam is put in place for the new Newton North High School. 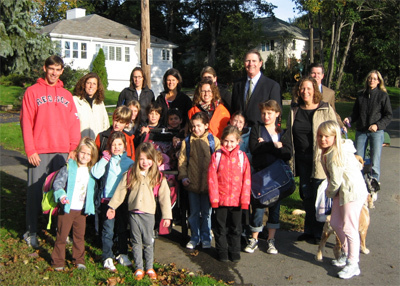 Alderman Baker with parents and schoolchildren on their way to the Ward School in October, 2008 as part of the "walking school bus" initiative to encourage more walking to school. 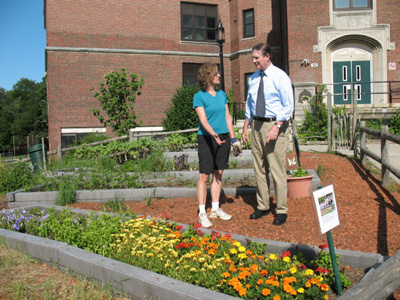 Lisle discusses the Ward Elementary School garden with a Ward parent. 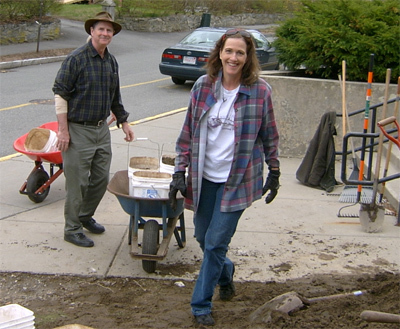 Your help on Newton Serves Day was way above the call of duty and we totally appreciate the effort you made. Without your support (food, extra recruits and relentless hard work) we would probably not have achieved even half of what we got done. Our school grounds look absolutely beautiful and we will be enjoying the view for months to come. Thank you so much!! I have attached some photos from yesterday for you to remember us by!